Figures just published by the OECD show that major donors’ aid to developing countries, known as Official Development Assistance or ODA, fell by nearly 3% to 133.5 billion in 2011 compared to 2010, the first drop since 1997 when debt relief figures are not included. This global average hides even worse news. Within total net ODA, aid for core bilateral projects and programmes (in other words, excluding debt relief grants and humanitarian aid) fell by 4.5% in real terms and by 8.9% for flows to the Least Developed Countries. In 2011, the largest donors were the United States at $30.7 billion (a fall of 0.9%); Germany ($14.5 billion, up 5.9%); the United Kingdom ($13.7 billion, -0.8%), France ($12.9 billion, -5.6%); and Japan (10.6 billion, -10.8%). Denmark, Luxembourg, the Netherlands, Norway and Sweden continued to exceed the United Nations’ ODA target of 0.7% of GNI. In real terms, the largest rises in ODA was registered in Italy at 33%, while Greece showed the sharpest drop, at -39.3%. The recession and sovereign debt crisis certainly played a large role but they don’t explain everything when you look at the national-level data. 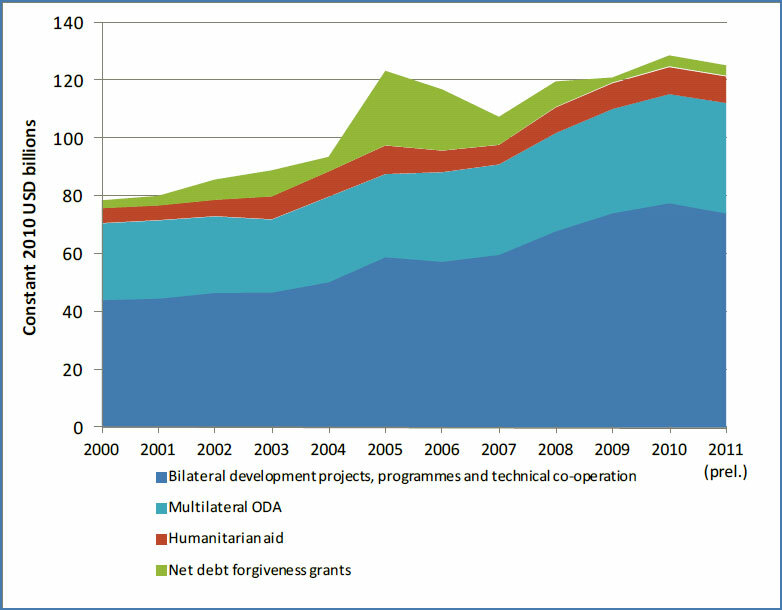 Spain’s ODA fell by almost as much as Greece’s (36%) but Portugal’s aid was down by only 2.8%. OECD Secretary-General Angel Gurría warned that “the crisis should not be used as an excuse to reduce development cooperation contributions”. Governments are however under pressure to reduce aid spending in line other cuts, and the OECD-DAC Survey on Donors’ Forward Spending Plans for 2012 to 2015 suggests that global country programmable aid (CPA, one measure of receipts by developing countries) may rise by 6% in real terms in 2012. However, this is mainly because of expected increases in soft loans from multilateral agencies funded from capital replenishments during 2009-2011. From 2013, global CPA is expected to stagnate, and could confirm earlier findings such as those of the 1996 Development Cooperation Report that it takes several years from the onset of a recession for the full impact to be felt on aid flows. Apart from calls to help combat the effects of the crisis at home before spending money abroad, there is a more general criticism of aid, claiming that it has not only failed to do its job, but has held back development and helped keep corrupt regimes in power. Brenda Killen of the OECD Development Co-operation Directorate answered these arguments in the latest OECD Yearbook, and concluded that aid is needed because “in our highly interdependent world, what happens with the economy, security, climate and health of any country affects us all”. Aid is a small part of financial flows to developing counties, behind investment and remittances from workers living abroad, but it is still a vital tool in the fight against poverty. Everybody would like to see its role diminish, and even disappear because it was no longer needed. In this context of dramatic reduction of society life cycle , it’s becoming complex to waste energy and time with the development aid issue. Because, the distance reduction , the dramatic reduction of the product, market,technology and radical innovation life cycle and the emergence of creative and green economies are providng so many opportunities of growth and development. I’m happy and thankful that you observed a drop in the development aid in this current transtional period. Because the overwhelming importance of the transitional effects have obliged many western countries to reduce their development aid and allocate more resources and energy to the structural reforms and investment in the human,structural and institutional capitals. You did well to provide the empirical evidence of this drop and put emphais on the fact that the recession and the foreign debt crisis are not the only one responsible. 1. The improvement of the Global Production Network featured by the clusterization and the technopolization of the western economies. 2. The shift of our productive away from the traditional and obsolete industrial activities to the Nano-bio-Technologies and Electric Vehicules Revolutions. 3. Throughout the development of the creative and green economies. 4. Throughout the emergence of natural,cultural and human capitalism. Brenda Killen is right to put emphasis on the interconnexion of the productive structure. This stylized facts valid the overwhelming importance of the Global Production Network and put emphasis on the need of more transparency in the management of the development aid. Furthermore, we need to take into account the overwhelming importance of the increasing return to scale in the development model. It will imply the need of intensifying the integration of the developing and emerged countries in the Global Production Network. Because the main challenge of the developing countries today is the inability of integrating the Global Production Network of the high and middle added value good and service. They unfortunately keep putting emphasis on the exportation of the raw materials and don’t suit the location choice of the MNCs’ down and middle stream activities. I’m happy that US is taking a lead in the development aid. We commit to preserve the human dignity all around the world and are willing to help. Meanwhile, we commit as well to fight corruption, inefficient leadership and the lack of transparency in the management of the development aid.